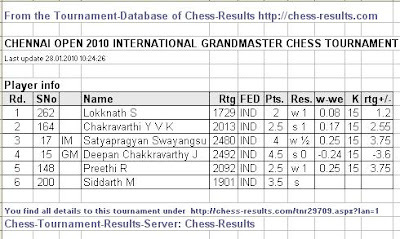 Someone texted GiLoCatur about IM Lim Yee Weng participating in the Chennai International Chess Open held from 25th January until 3rd February. The 11-round Swiss tournament has attracted an amazing 387 total participants from 14 different countries. 71 titled players which includes 18 GMs, 3 WGMs and 28 IMs are among the participants. Click here to check on the tournament results. Until today, five rounds had been played. IM Yee Weng has a very commendable result thus far, in GiLoCatur's opinion. He scores 3.5/5 points. He won against all three lower-rated players, drew one with a 2480-rated IM and lost one to the 15th seed, an Indian GM in Round 4. GOOD LUCK! and MAKE MALAYSIA PROUD! If a Kid Can Promote Chess, Why Can't Us? What can we learn from the above and below picture? A picture tells a lot. It's a very simple answer but may teach us something. Two boys wearing school uniforms are playing chess while their friends were watching. When and where they were playing? Actually, they were playing after school in the evening (they are in afternoon school session) and on the pathway while waiting to be fetched by their parents. In fact the player on the left is Fahim, GiLoCatur's youngest son. What else GiLoCatur can do when he insisted to bring a chess set to school. He teaches and influences his school friends to play chess. He is, without knowing it, promoting chess in school. 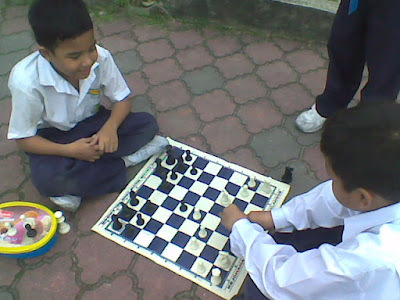 If in USA, there is Chess-In-Schools (CIS) program, here in Malaysia Fahim is having Chess-After-School program. GiLoCatur is actually speechless and had to wait him finish his game. If Fahim can outreach his school friends for chess, why can't GiLoCatur and other adult chess players do the same. If Fahim is brave enough to let all eyes watching him playing chess on the school pathway, why aren't us the big boys brave enough to let all eyes watching us play chess at mamak restaurants, "kedai kopis", MacDonalds, parks and etc? In conclusion, a kid may teaches us adults something like this. Furthermore, we adults should go back to basic in conducting and doing something especially in promoting chess. So, as an idea to promote DAT chess center, conduct chess outreach program and awareness. A National-rated chess tournament. When? 15 MAY 2010. Where? SMK Telok Panglima Garang, Kuala Langat. Chess players, you have about 3 and a half-month to practice and get ready for the event. Also ample time to plan for travelling arrangement for all the players from other parts of the country. What a nice chess tournament venue during the Jeram Chess Open. It deserves the national-rated event. GiLoCatur could not take many photos for the Open section because did not want to disturb the focus and concentration of all the players especially the pros with the flash. Furthermore, GiLoCatur was busy taking pictures for the other two categories - Under-18 and Under-12. Chess players and chaperons were waiting for the next round. Waiting for the chess pairings to be put up. 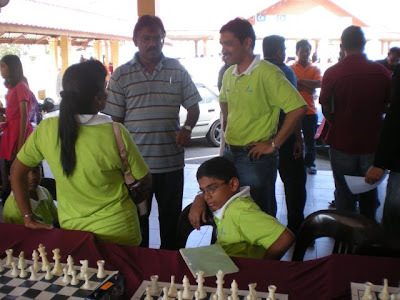 Not only Jaffolea Chess Club wearing green shirts. The Sivanesan's from Seremban are also in green. City Day Blitz Tournament, y'all! GiLoCatur believes most chess players know about it. Many play it even though some of them do not prefer it including GiLocatur. For chess newbies, let GiLoCatur explains about it. Blitz is a chess game of 3 to 5 minute per side. How about if the time control is between 15 to 60 minutes per side? It is called either rapid or quick chess. 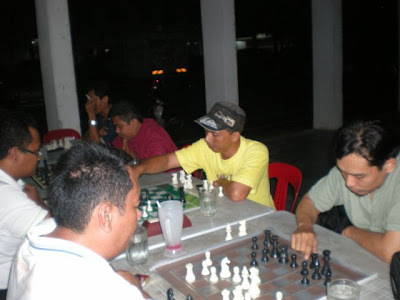 Rapid chess is very common in Malaysia. The most common time control is either 30 minutes or 25 minutes. In America, the former is known as G/30 while the latter is G/25. During chess sparring, GiLoCatur prefers to play rapid 20 minute time control per side. But how about 10 minutes or maybe 7 minutes. Is it a blitz or a rapid? Instead of 5-minute blitz, GiLoCatur prefers 10-minute. Besides, GiLoCatur also prefers 45 minute time control. 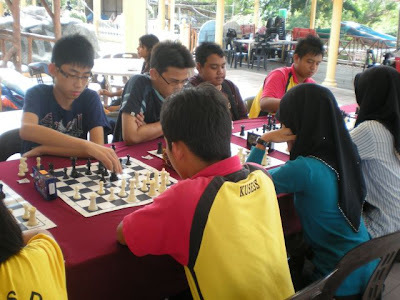 Two annual chess tournaments that use such time format is Temerloh Open and MMU (Malacca Multimedia University) Open. Just unfortunately, this year edition for MMU Open, the time control would been changed to 30 minute (G/30). 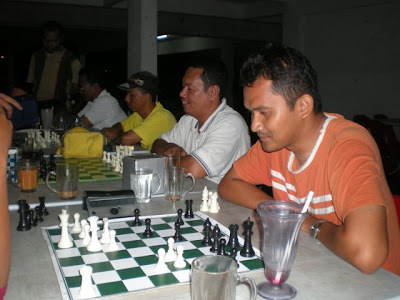 GiLoCatur is sure that many Malaysian chess players are not aware or used to play 1 or 2 minute time control. It is very rare in this country. It is called bullet chess. One of the chess players capable and good in bullet chess is Susan Polgar. She even can beat male opponents easily. Based on a documentary GiLoCatur once watched, the time needed for Susan for a chess patern recall is about 3 seconds. Thanks to her father's chess puzzles that Susan and her two other younger sisters used to do during the childhood years. There is a another name for either blitz or bullet chess. It is lightening chess. What is the common, normal or standard chess time control? It is 60 to 180 minutes. It is also known as the classics. 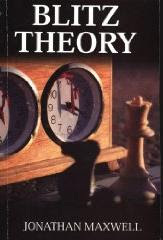 Why GiLoCatur is writing about types of chess based on time control? Is there any fee? Yes ... How much? RM25 for the entrant fee. Or it is only RM10 if you participate in the DATCC Individual Weekender tournament. For further inquiry, please email to najib.wahab@hotmail.com. "Ni tak boleh ngap banyak-banyak, nanti ngantuk. Eh! alamak lupalah pulak, lepas ni aku nak main opening apa?" Ustaz Zamri, "Ko jangan main-main. Cuba ko tengok color baju aku. Sama hijau tak dengan World Police Champion. Kami si baju hijau tau!" From Bukit Beruntung we came. Zainoor Ikmal Maisarah, "Look mom! That uncle takes my picture. Mana aci, I am not ready yet." The happy couple of Azman Hisham and Zaza. 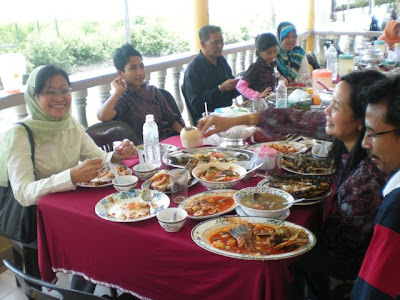 Surely, happy one ... after the stomach is full with variety of fresh and delicious seafood dishes. Diet is not a concern, eh! Thanks a lot to Puan Zurin for her lunch treat. Ng6 and Ng6 Jr. "Like father like son!" 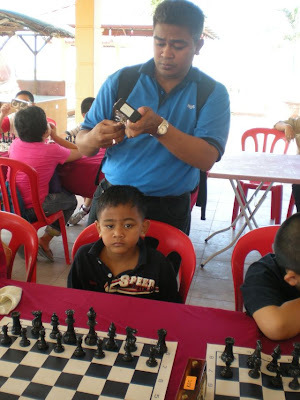 Ng6 had brought his junior to the Jeram Chess Open for a tournament debut. A GM in the making. Bravo, Ng6! Seventy three (73) participants in the Under-12 category. Some of them had their debut tournament. Three players among the top 10 winners has much better tournament ratings or + difference (W-We). 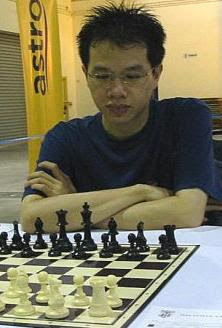 Chee Seng had TPR (Tournament Performance Rating) of 1636. 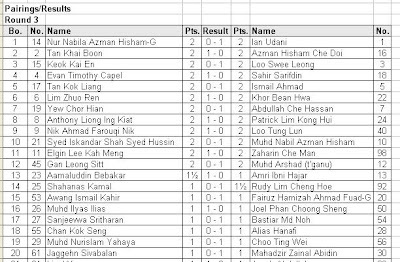 He had a big win against Amira and Irfan in Round 3 and 4 respectively. His MCF (national) rating is 1373. Meanwhile Sheng Yip had 1700 TPR. His current national rating is 1207. While Chee Wei, the 10th place, jumped from 1198 to 1434. The total number of players in the Under-18 section is thirty three (33). How many participants in the Open category? Seventy eight (78) players. 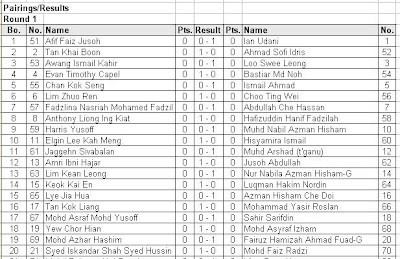 So how many participants in the Jeram Chess Open? 73 + 33 + 78 = 184. Not bad, uh? Click here for the full results. 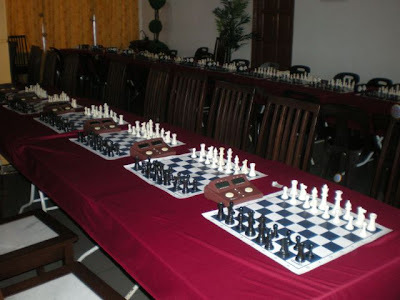 Click here for pictures of the tournament by SelChess blogspot. 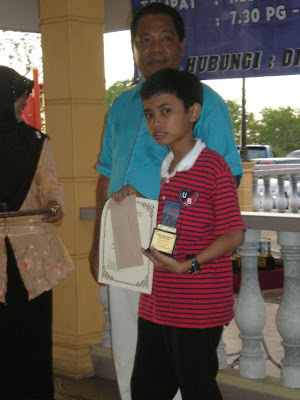 Still Hope For Chess In MSSM??? Below is the excerpt from Tony Mariadass's posting in his blog at http://level-field.blogspot.com that GiLoCatur wants to share with all the readers especially the Malaysians regarding the MSSM saga. Tunku Imran a firm believer of grassroots development, had naturally expressed his disappointment of the exclusion of 11 sports and the cut of annual budget, to the DPM when he was the guest of honour at the Olympian Night on Jan 16, at the Wisma OCM. "When I mentioned about the cut of sports in schools, he was totally surprised," revealed Tunku Imran yesterday. Tunku said Muhyiddin's response was: "How can that be. Here I am talking about making sports a policy in schools and here they have cut the number of sports organsied in schools. I am not aware of this." So who is this person who is more powerful than Muhyiddin to have taken the decisions without even consultation or briefing the Education Minister? For GiLoCatur who is just active in chess scene in the recent years, the annual Malaysia vs Singapore Chess Challenge is something new. GiLoCatur has never watched such event even though such rivalry encounter has been held about two decades. If the 2004 edition is the 16th of such Challenge, it means the first one was held in early 80's. GiLoCatur will try to compile all the info available regarding the rival challenge saga between the two neighbouring countries. GiLoCatur knows about the annual Selangor v Singapore fight in football, but not Malaysia vs Singapore in chess match. What it is all about? How's the past records or results? Who represented Malaysia in the previous challenges? GiLoCatur will try fnd the answers. Who will captain for this year's edition? What's the format of the challenge? So, please come back again for more reports on such challenge meet. 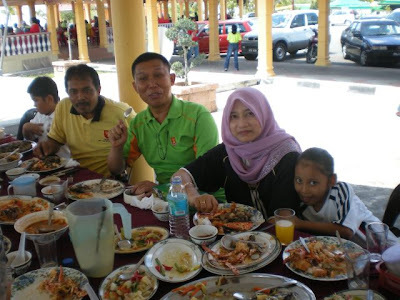 Tomorrow, Jeram Chess Open will be played at a seafood restaurant named "Restoran Ikan Bakar Pantai Jeram". It is a national-rated event as promised by the organizer. Its format is a rapid game of G/25 (25 minute time-control per player) with 6 or 7 rounds of Swiss System. 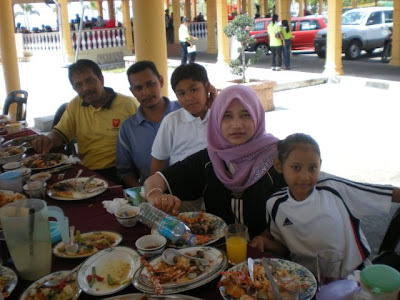 Insya Allah, GiLoCatur and family leave home in the early morning to reach the venue which is about an hour drive. So, GiLoCatur needs not to stay in a lodging near the venue. Maybe some participants will stay at a lodging for tomorrow's tourney. SEE YOU ALL THERE, TOMORROW! So for those people, check out below interesting places around JERAM and KUALA SELANGOR. Mangrove Forest Reserve - serene mangrove forest at Pantai Indah Resort, great for collecting seashells, small prawns, fishes, cockles, crabs, clams, hermit crabs. Excellent for educational tours and activities. About an hour ago, GiLoCatur and Fikri just arrived home from a chess sparring session and mini-tournament at Subang Utarid. This week the normal venue at MacDonalds has changed. The reason? Several 17ChessClub regulars - Syed, Yen Fisher, Sahir and Akmal, did not join for their own reason. Eight players participated in the mini-tournament. The format this time was not blitz, it's G/20 or 20 minute time-control. The number of rounds was 3. The mini tournament started at around 10.00pm. Between rounds there were sparring games - blitz 5 or 10 or rapid 20 minute. The results after Round 3 as per above. 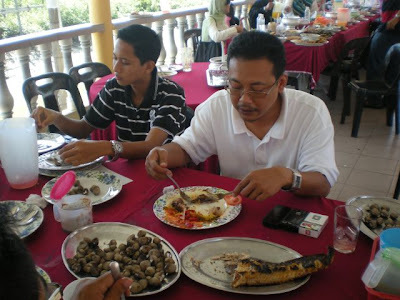 Jeff and Fauzi, wearing white shirts , sit side by side. They were focusing on their games. Focus is very essential in playing chess. In other words, chess helps and teaches us which include the school children to focus. This is one of the benefits of playing chess. The pictures are the proof of that. Bermain catur melatih anak-anak kita untuk fokus. 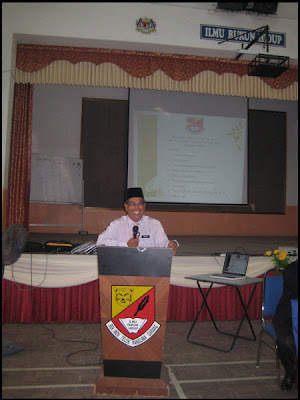 Seorang pelajar yang memiliki fokus yang baik yang digunakan ketika di kelas dengan fokus mendengar apa yang diajar guru, ketika mengulangkaji pelajaran dan ketika membuat kerja rumah, Insya Allah, akan lebih berjaya dalam pelajaran dan peperiksaan. Sulaiman aka Simon (yellow shirt) and Jeff. Tonight was their first encounter in a tournament environment. Previously, their encounters were not in a tournament like where there is no time pressure and pairings based on playing performance. Basically, playing chess in tournament is different with playing chess just for fun and without time control. You need to handle the pressure. 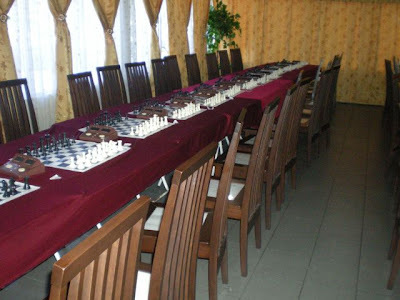 By having regular (say weekly) chess session in a tournament-like environment will surely improve your games. Hopefully, it will improve the chess quality among Malaysian players. Azam was ready for his next move. He came a bit late. Had to settle his fatherly duty first. What a spirit to play chess. To all wives, do not worry! Your husbands are not involved in bad and immoral activities like gambling, taking drugs and clubbing. They are just playing chess. Sharpening their analytical and thinking skills. In fact, it is a positive and good activity. They learn and practice to be rational rather than emotional. GiLoCatur believes they have performed their husband and dad responsibilities. Ng6 (wow! in red? and office attire?) had his final 3rd round against Fauzi. 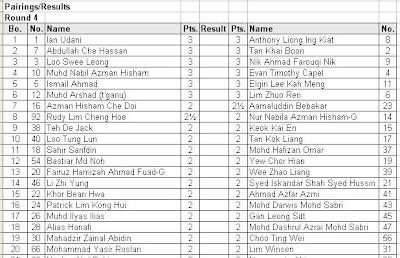 While Maxtal had his final round against Fikri. Their match is to decide the champion. Syazrin was also coming but missed the mini tournament. 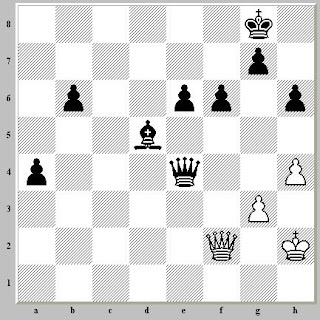 Immediately, he had sparring sessions (blitz or speed games) with Ng6. GiLoCatur wants to share below blog posting by Elizabeth Vicary in her blog. GiLoCatur found it interesting that we can learn something from it. 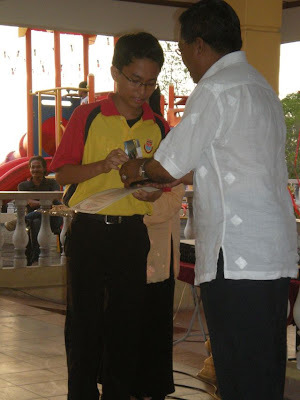 First of all, surely, many especially Malaysian chess community would like to know who she is. GiLoCatur also does not know her personally but would love to know and meet her personally to talk and discuss about chess development among school children. The first time GiLoCatur heard and knew about her name was when reading "Kings of New York", a chess book authored by Michael Weinreb. As far as GiLoCatur remembers from the book, Elizabeth teaches chess to students at public schools in the United States. She involves in the Chess-In-School (CIS) program. ( GiLoCatur : Is wondering whether this sort of program can be implemented in Malaysia? ) She happened to be a chess teacher and motivator to some of the Edward R Murrow's chess team members, the America's top high school chess team. pretty lady, eh? dare to challenge her? I keep being impressed by Alexandra Kosteniuk (the above picture). I had gotten a good impression a year ago, when she did a benefit simul at the British International School and played Alexis and Ezequiel. I saw her again at her book signings at Grade Nationals. For the most part, I think introducing kids to strong players usually results in awkwardness. The kid has never heard of the strong player; the strong player doesn't have any interest in talking to the kid, and they have absolutely nothing in common anyway. But if the kids get a chance to meet a world champion, I figure of course I should make them. I'm a teacher, right? So I go up the elevator and round up the first ones I see, and bring them to the bookstore to meet her. On the ride down, I ask them to think what questions they want to ask her, on the grounds that you don't get too many chances in life to ask a world champion anything you want. So the kids are all very bashful at first, and then Justus blurts out "What's it like to be a world champion?" It felt fantastic when I won, and I was really happy for a while, but the thing is, it's not like you win the world championship and then ok, you're done, you can relax. The next tournament you play in everybody tries to beat you, and you have to play well in every game and prove that you really deserve to be world champion. You can lose at any moment, to anyone, so it's a constant struggle, you have to always try to improve yourself, to raise your level. But this is also what's exciting and it gives you a lot of energy. I was blown away by this answer. I thought it was a fantastic thing for a talented kid to hear, that, as hard as it is, you have to get used to putting yourself on the line in every game because you will never stop having to do so. And that you can and should use competitive emotional energy to push youself to work on chess: that doing this both helps your chess and gives you something positive to do with the feelings. Then Azeez asked Alexandra what chess books she liked. At first, she started talking about how when she was a kid, she liked reading stories about chess players, more than instructional books, but Azeez just gave her a blank stare, and then she said she had really enjoyed Jesus de la Villa's 101 Endgames You Should Know and had made flashcards out of the 100 positions. One side of the card had the position; the solution was written out on the reverse, and she quizzed herself on them until she knew all 100. I'm equally amazed by this second display of question-answering virtuosity: in two sentences, she turned studying technical endgames into a fun activity with cards. wow. I casually say to Azeez, "I'm pretty sure we have that book in our classroom library; let's make flashcards and learn all 100 endgames when we go home," and he says "yeah! great! that sounds like fun!" 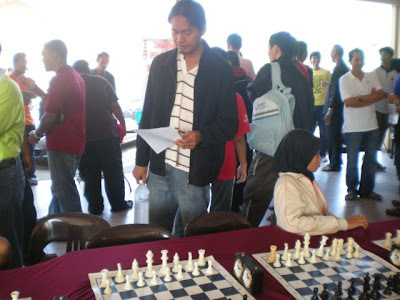 In Malaysia, books signings during chess events should be conducted and held. We need to invite the authors of chess-related books during international chess event like the (DAT) Malaysian Open and Selangor Open. In GiLoCatur's observation, there is still gap between our elite, IMs and FMs, and top players with the juniors in terms of socializing and communicating. Even GiLoCatur is shying away from saying hello or hi to them afraid of not getting friendly response. Maybe, they feel the same too. In short, the gap need to be look into. What we need is the mediator whom can help close the gap. Chess players should always keep their energetic enthusiasm and excitement level even though he or she has achieved lots of championships and trophies. Reading books about chess players is very important for a kid or a child. So, chess parents, buy and borrow books about chess players for your children. Or get them from the internet. Flashcard is a method used by chess masters and experts as a way of fun learning. So, start using this method. Any parent can do this for their chess kids, right? Surely, school chess club teachers can do the same. To achieve greatest achievements in chess, one cannot omit reading and having chess books. It is the very essence of being chess masters and experts. The sad fact about us Malaysians is we don't like reading. Reading is not part of our culture. We read just for examinations or mostly about gossip and entertainment. About US Chess School program, from here. The US Chess School is a nonprofit venture, the mission of which is to help the most talented young American chessplayers by organizing free week-long training sessions with top grandmaster coaches. Three sessions are held every year; locations, trainers, students, and age groups vary. 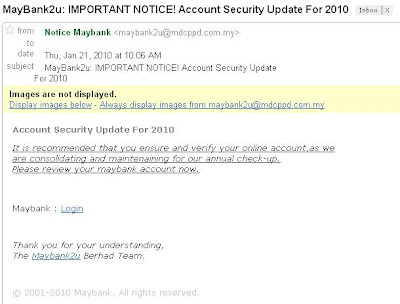 Diharap semua pengunjung Blog GiLoCatur berhati2 terutamanya kepada pengguna online banking MAYBANK2U. Scam seperti di atas kerap berlaku. Sila contact pihak bank dahulu untuk kepastian. Jangan sampai terkena! 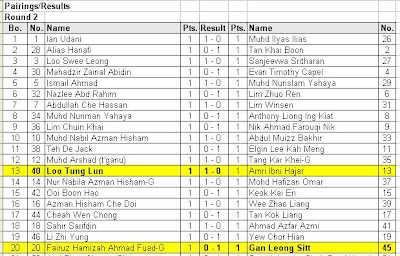 Below are the results of the first round Insofar Invitational Tournament held in PKNS, Shah Alam. 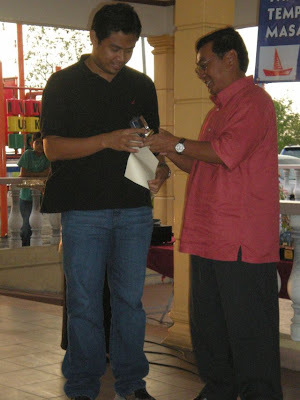 While surfing on the net, GiLoCatur found the following interview between Edwin Lam Choong Wai, a ChessBase columnist, and GM Nigel Short of England (the above picture, from chessbase.com). It talks about chess journalist and chess bloggers. His points and insights can be a reference and guide for all chess journalists (which GiLoCatur is still very far distance to be) and bloggers. Edwin Lam: In your opinion, what was the role of a chess journalist back then? Nigel Short: Chess journalists should inform and entertain. Edwin Lam: The Internet emerged as a great force in the 1990s. In your opinion, how has the Internet changed the face of chess journalism? 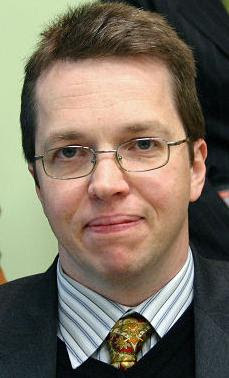 Nigel Short: It has made it much easier to cover events. Edwin Lam: And, how has the Internet changed the role of a chess journalist in the past 15 years? Nigel Short: Nowadays everyone is a big genius sitting on his fat arse in front of the computer watching Rybka and Fritz whirring away. Therefore journalists who just copy and paste cyber evaluations don't produce anything worthwhile. I am certain there is a huge unmet demand for humorous, instructive, amusing, quality writing. Edwin Lam: Over the past few years, very many chess players have also started blogging. How do you see the role of bloggers being different from that played by a chess journalist? Nigel Short: I have not given enough thought to this question. Teachers and Chess are ONE! GiLoCatur happened to found below interesting article regarding chess and teachers here. Read on, hopefully lots can be learnt. Chess is often cited as a means of promoting cognitive and affective growth in students. We review some of that literature, but we primarily focus on our personal growth journeys through chess, showing what it gave us intellectually and socially, and how it has encouraged us to share this type of growth with others, building a community of learner/scholars. We conclude that teachers who start and participate in school chess clubs and encourage their students to participate in all of the activities of the chess world, including adult chess clubs, will promote their intellectual and social growth for a lifetime as well. Teachers may be skeptical at the almost breathless reports of the benefits of chess they hear about (Ferguson, 1995), how it improves problem-solving skills (Horgan, 1989), how a school adopted chess into the curriculum and test scores suddenly skyrocketed (Smith and Cage, 2000), but such studies provide quantitative proof that chess improves student learning. In this article, we show the growth chess gave us in the intellectual and social world. Chess is not just a game played by geeks, nerds, and street chess hustlers; it is an intellectual activity that provides a world of growth to all from youngsters to adults. Teachers can help to build a community of learners by starting or participating in an after-school chess club. A teacher starting an after school club may be disappointed by the fact that the club will probably consist of mostly boys, but it is precisely young men who can benefit most from an non-violent, intellectual alternative to other types of communities (Kennedy, 1998). Teachers can help by encouraging young people to play in adult chess tournaments and by going to adult chess clubs as well. For those teachers who want to learn not only how to start a chess club, but also find ways to use chess within their curriculum (Chess can be used as analogue to teach the Pythagorean Theorem, to teach physical concepts, and even included in reading assignments through its popularity in the Harry Potter books--for an example, visit http://groups.msn.com/alabamachessorganizers/harrypotterplayschess.msnw. There is a Chess in Education certificate offered by distance learning at the University of Texas at Dallas--http://www.telecampus.utsystem.edu/programs/Chess/chess.html. The United States Chess Federation also offers hundreds of pages of free resources to teachers at its web site--http://www.uschess.org. The community of learners in chess is vast. Chess is not just competition, it is an intellectual growth strategy that has been implicated as a means of preventing Alzheimer's disease (Friedland, et. al. ,2001). An old Indian proverb states that chess "is a sea in which a gnat may bathe and an elephant drink." We feel richer for having swam in its waters all these years, and encourage other teachers and students to jump in and join us. 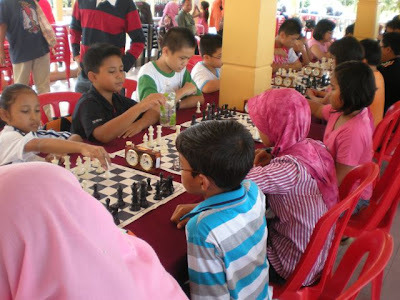 Teachers are one of the main groups in Malaysia to promote chess among the youngsters - a fact no one will deny. Teachers who promote chess in this country should be appreciated, recognized and supported. 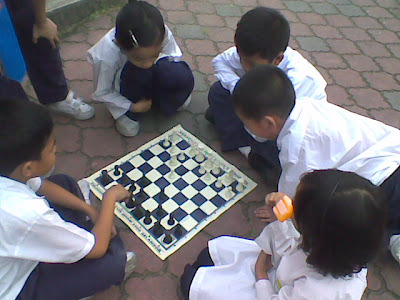 Chess should be taught and encouraged in the Malaysian schools. More and more chess programs after school or during school should be organized and implemented. Activate and promote school chess clubs like in the school magazines and newsletters. Teachers should be united in promoting and organizing chess workshops, seminars, awareness programs and tournaments. 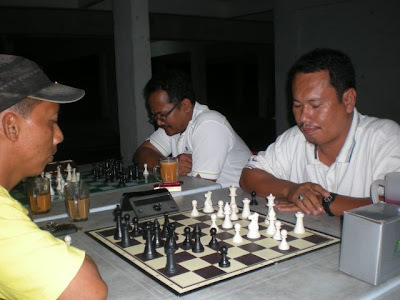 KL Teachers Chess Association is one good example. Taking a break during work, what GiLoCatur is gonna do? Checking the blog ... Checking on what? GiLoCatur's eyes were glancing at the visitors info provided by widgeo.net. The visitors of GiLoCatur's blog are basically from which locations? Most of them are from Malaysia. Out of the 65 visitors showed by it, GiLoCatur is interested to know the four following locations - Pathhead, Basingstoke, Urbana and Lausanne. The last one sounds familiar. So, GiLoCatur started researching and "googling" (what a powerful search engine, information on fingertips or mouse clicks). Let's start with Lausanne. Lausanne is situated in the shores of Lake Geneva, Switzerland. The headquarters of International Olympic Committee is located here. (Click here to find out more) No wonder it seems familiar. It is in a beautiful country. So, someone from the city has visited this blog. Who is he or she? A Malaysian? or else ... But one thing GiLoCatur is sure is he or she is a chess fan. So is there any link between Lausanne and chess? The answer is surely yes. What are they? 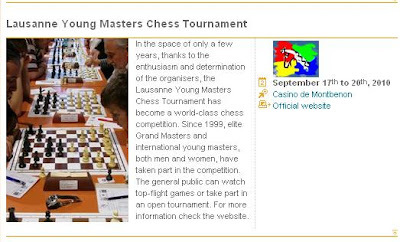 It organizes Young Masters Chess tournaments where players like Alexandra Kosteniuk takes part. If you don't know who is she, find it out. A chess fan should know about her especially the girls. This year edition will be held from 17th to 20th September. For the Malaysians who can afford to participate in the tournament and visit the beautiful city, please do so. Check out the details of the tournament like who to contact in its official website here. Then Pathhole and Basingstoke. The former is in Scotland while the latter is in England. Maybe the visitors from these two village and town are the Malaysians staying there. GiLoCatur is hoping if the visitors read this entry, they can provide some info and comment. As travelling or "M"engembara is one of GiLoCatur's hobbies, having to know about such places from someone there is enough. GiLoCatur loves to travel to small villages and towns besides the popular spots to see the real life and beautiful scenery. 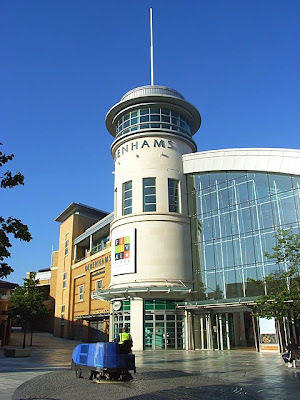 Check out about Pathhead, here, and Basingstoke, here. The last one is Urbana. Where the heck is this place? Actually, Urbana is a small city in Illinois, USA. It has about 40,000 population. One thing that GiLoCatur likes about villages, towns, and cities in the United States is that they have information about their population. The info is shown in a signboard that is put up and can be seen when you are entering them. Besides that, in their public libraries they have the records and information almost for each resident. In Malaysia, we do not have this sort of record and information that is easily accessed. This sort of culture of having easily accessible information and records need to be alive and in place. Facts and figures should be available to all. If you are interested to explore further about it, go to this link. Here, GiLoCatur also wants to share about chess clubs overseas. We should learn how to promote and encourage chess clubs to grow in this country. The more chess clubs in this country, the better chess would develop and grow. In that case, it would be closer for Malaysia to have her first GrandMaster (GM). 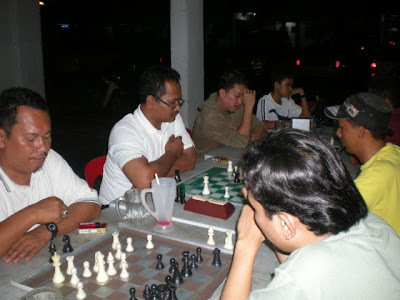 GiLoCatur welcomes any chess club in Malaysia to share their activities and information in this blog. Foreign chess clubs are also welcome to share experience, knowledge and activities. Who knows, we can have chess friendlies. 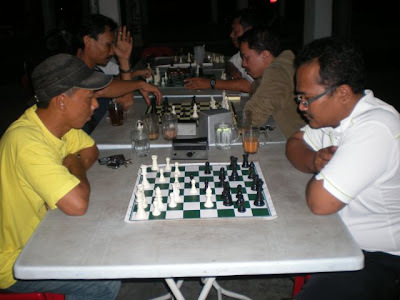 In the meantime, GiLoCatur will try to promote 17ChessClub and Persatuan Catur Sabak Bernam (PCSB). So, stay tune and always comeback! "chess is all about seeing things ..."
GiLoCatur remembers that an American junior chess player once said that "chess is all about seeing things that no one else sees". While looking back at the games of GiLoCatur's daughter, Anis Fariha, GiLoCatur was amazed how she could not see the checkmate move. She moved 43. .. Qg2+ and the game finally was over after 15 more steps. During then, Anis had National ratings of 905 while her opponent had 1065. That is the beauty of CHESS! Isn't CHESS amazing? All players at the top six tables had the perfect 3/3 score going to the fourth round. Basically the are the top 12 seeds. Can Ian Udani hold until the end of Round 7 to win the one thousand RM? Or who will spoil his attempt? The first Round - the seeded players all cruise through with their victories. 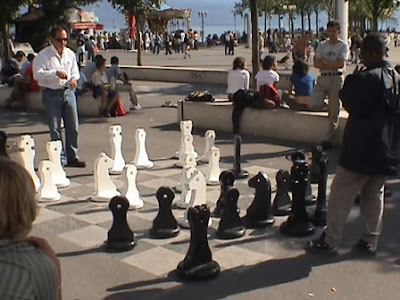 GiLoCatur finds below very interesting and good opportunity for chess to be played at popular tourist spots. So it is for the chess fraternity to grab the golden chance and opportunity to work with the Tourism Ministry. LANGKAWI, Jan 16 (Bernama) -- The Tourism Ministry will continue collaborating with sports organisers in hold sporting events at tourism venues to attract more tourists to the country, said its minister Datuk Seri Dr Ng Yen Yen. She said this was especially so for the less well known sports as having them at tourism venues would give the sport and the venue involved an added boost. 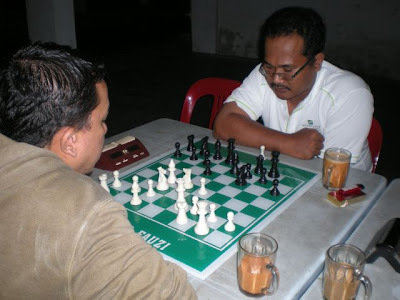 ( GiLoChess : Isn't that CHESS is not a popular sport or less well know as referred to by Datuk Seri Dr Ng Yen Yen? If Golf has an estimated 30,000 active players, how about chess? Less than 1,000 active players for sure. She told this to reporters after giving away prizes to the winners of the Royal Langkawi International Regatta here on Friday. 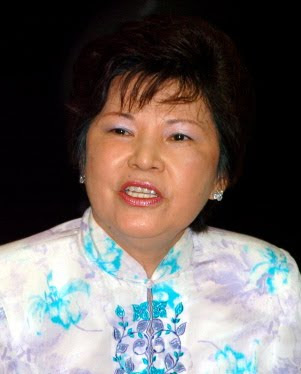 She said the effort would also further promote the ministry's "Malaysia My Second Home" programme. 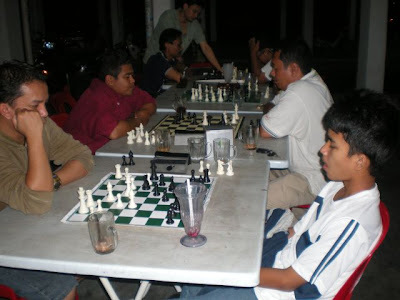 Why Chess is Dropped from MSSM 2010? What? Another National-rated Chess Tournament! !